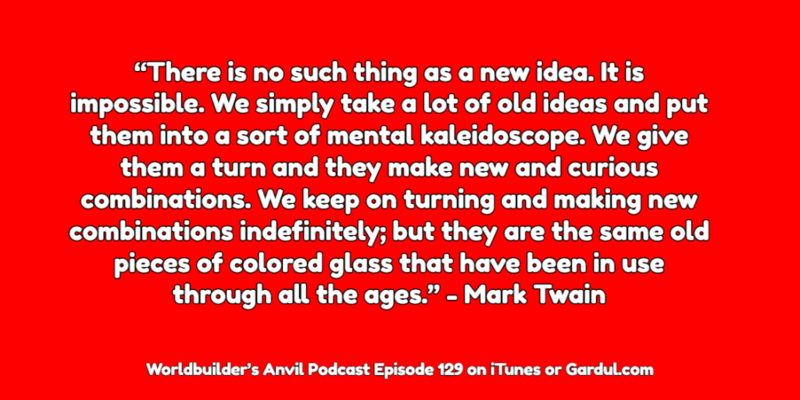 Episode 129: How to make your fantasy world original? We will make the most original world ever! 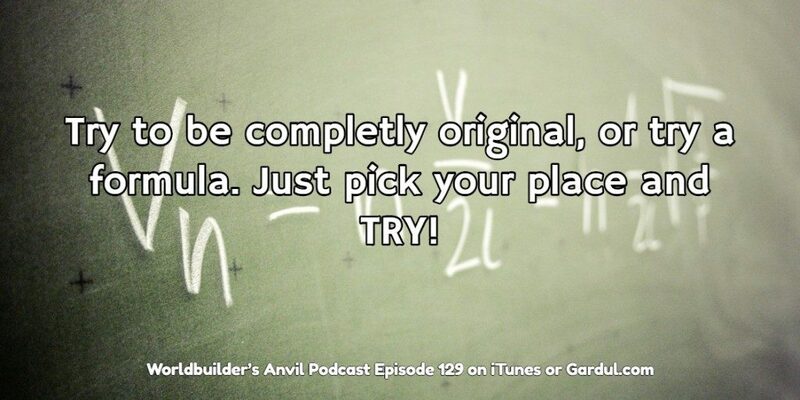 Today’s Topic – The Originality Trap And How To Avoid It! I have spent countless hours working on being original. It was truly a concern. I worried about my clothes, my music, my art, and my fantasy world. I wanted everything to be original. However, I like most people failed at the task. I read books people did not read. I played games that others made fun of. I wore all black, just like most of my friends. I listened to metal, unlike all of the other people. I wish I could have learned the truth earlier. I was not original; I was just not mainstream. However, I could not have been original. At least not by my definition, I was merely an arrogant jerk who like to think less of people who I thought brought into the system. And was I not only not original. I was an idiot. It took me well over twenty years to figure it out. I started to figure it out in 1999 when Stardust came out from Neal Gaiman. Many of my players teased me when Neal had a city called Highwall. How dare he! I had been using that name for a decade. So, to proof my originally, I wrapped up that game and started a new game that took place in space. I could force the players to fly away from my embarrassment of the City of Highwall. 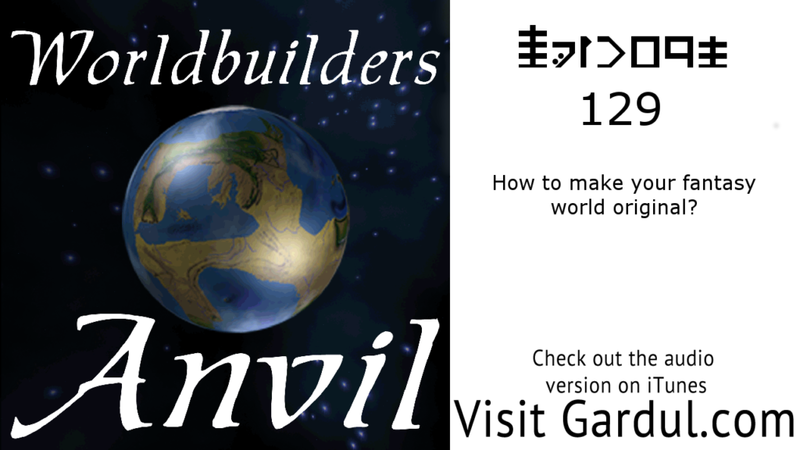 In my fantasy world, Gardul. There were a few being called gods. They gain power through belief. So, I wanted to have them use the players to battle each other to gain power. The older gods would try and seize the power away from the newer gods. I was so proud of my story. During the early stages of the story, one of my friends commented how he loved this game. It was just like a book called, “American Gods.” I was insulted, I denied it and to prove my point I had them shoot and kill and themselves at a previous point in time. This created a paradox that destroyed the universe. Honestly, I was so agitated that I have never spoken to Neal again. Of course, again might be a bit of a stretch since I had never had the fortune of meeting Mr. Gaiman. However, the incident did teach me a lesson. No one can be completely original. Let’s Face it, even if a person could survive doing nothing that has never been done before, which is impossible. The had an origin from two other people. The truth is if I had thought about what it means to be original instead of worrying about what people perceived me to be. I could have saved a lot of time. Because the reality is as similar as all human beings are there are no two exact copies. The environment effects all of us differently. My exact taste in music, art, and entertainment is closely matched by my friends. However, they are never exactly the same. And at a more fundamental way, we vary at a genetic level. And thanks to a study about identical twins, by Geneticist Carl Bruder, he found even that there were subtle differences in them. First choice for the win! Now, I have, to be honest. The second choice stood out to me. However, I had to dismiss because “novel or unusual” are too subjective. What is novel to me a white male who was born in Indiana and now lives in Connecticut might not be all that novel to an Assamese female from India. And even if we do agree something is novel, there will be a troll on the internet that calls us both idiots. So, that really leaves me with the ability to think independently and creatively. Now, I know what you are thinking. The troll will still call me an idiot because they are still objective terms. And, you are right. However, I think they can be used in non-subjective ways. So we will just pretend that I am correct. Now, I will wait for a few moments if you want to troll me in the comments. Now, Since I have spent years as an information technology analyst. I have to say what is out of scope. What I do not mean by being original in my mind. First, writing about underrepresented peoples, cultures, or genders will not make a work original. Even, if you think there should be more books written from different perspectives that will not in and of itself make it original. Even, if you hate political correctness and want to belittle the underrepresented characters, you are not original. Also, rewriting the nouns to other nouns. If you call your rabbit a smeerp. Does not make it original. In fact, besides not be original as an author you will only create more work for yourself having to convey the sense that a smeerp is a rabbit. Frack, If you are going to go to all the effort to create a noun go all the way and create a new creature. Gorram, this one makes me mad. Do not be a tvtrope trope and do not waste your time. Now, you can be original even if you have a story about a smeerp hero that is underrepresented in western society. However, It will be because of the smeerp or underrepresented character. It will be original because of the novel thought and creative style you add to the story. So, we have figured out that it is possible to create something that is original. However, it could be forgotten or even hated by people. Let’s be honest. There is a reason that TV, Movies, Video Games, and all creative content has formulas. They sell, and the thing that makes a classic a classic is the fact that it keeps selling long after it is released. Still don’t believe me. How many comic book movies have you watched since the creation of the Extended Marvel Universe was created? If you are like me, you have no idea because you ran out of fingers and toes. They are all a formula, and here it is. (Superhero * (2*Log(fun)) – (1 * the number of sequels) + plus a studio fee = Money from my wallet to be given to Disney. Now, only time will tell if any of those movies will end up being classic. However, most of my friends would agree that the Matrix was a classic. I agree, and I even like it the first time when I learned about Jesus in the bible. Yes, the Matrix is a hack and slash job of the gospels of Jesus, and I argued with countless people that it was not original. Now, I do believe original stories can become classics. However, if you steal a story that is already a classic, you have a head start. People love to identify with heroes and maidens. They judge fiction on what they believe or not. It is a curse that if we share our works with people. We usually want positive feedback. I remember a friend telling me that he was playing in a sci-fi game that was based on silicon lifeforms. He was attracted to it because it was not just another sci-fi game. The game master sold him on the original concept. And my friend even agreed that after playing it that the game master succeeded at making the game original. The only problem, he hated the game because he couldn’t connect with the characters or their struggles. I know this is an anecdote; I am not saying you cannot make it work. I am saying be careful what you ask for. What are we trying to make original? Instead of trying to make everything in our world or story original. We could focus on a comprise. We will add a laser gun to our super sword and sorcery adventure, and it might be enough to start a new property that Disney can by and make more movies over. The Story attached to it? Okay, I had to bring Star Wars in somehow. Forget the snarkiness; we know we are trying to think independently and creatively. We can comprise to attract an audience. We can give them something to connect with while focusing our creative on our strengths. For me, I am creative with evolving cultures, countries, and characters. However, I am not creative at new types of plants or farm creatures. Heck, I cannot imagine a modern society without farms. If you can create a modern society without farms, send me the link. I want to read it. But, really play to your strengths in world building, writing, and storytelling. The combination of all your imagination should make you game or book feel original. And isn’t that our ultimate goal. How to we make something original? 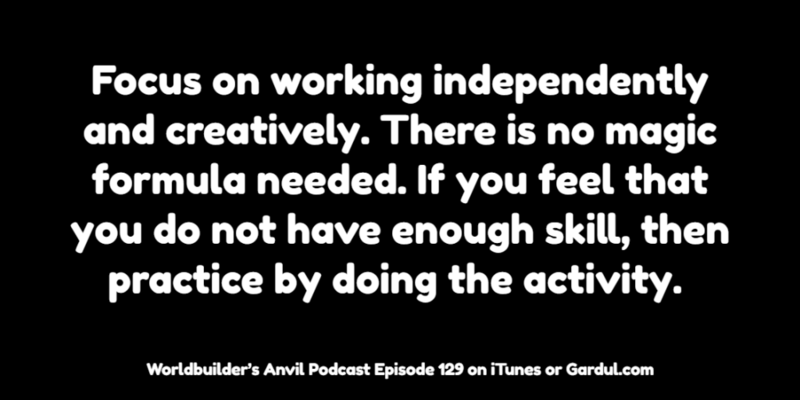 Focus on working independently and creatively. There is no magic formula needed. If you feel that you do not have enough skill, then practice by doing the activity. Write stories and share them with people. There are other writers or possible future fans that will want to help you. Take the constructive feedback and work to improve your skills. Working independently will come first. Most people are already able to do that. Creativity is more complicated than working independently. However, people who read have an imagination. Imagination is the pictures in your head that you see when you read a book. Practice, play, and push your creativity, and it will grow. Why Do we want to make something original? Maybe you want to prove something. Maybe to others or maybe to yourself. Maybe you think that being original will make you famous or better than other storytellers. Whatever you think, make sure that is your real goal. And do it for yourself. Have fun doing it. And do not waste your time obsession on the originality of every piece of content you create. You will end up wasting time. Time is the one resource you cannot make up. The Story attached to it? The form of the story? Do we want to be known for it? Have we something to prove? Call home before you finish work for the day and ask if you need to pick anything up on your way home. How to create the most original story, EVER!